It’s the universal law of food. Everything always tastes better at someone else’s house. I don’t know why that is. It just is. So when we were visiting long-time family friends in Nayarit, Mexico a few years ago, we spent the first part of the meal gobbling up a scrumptious Pan-Seared Pork Chop Casserole and the remainder of the time sitting at a tiny wooden table writing down every detail of every delicious morsel. The pork chop casserole has been a regular weeknight meal in the Montez Family for decades and makes for a deliciously flavorful fall dish. Unfortunately, it went the way of many recipes scribbled down in the “gotta-have-this-recipe-right-now” moment. It got forgotten about and lost in life’s shuffle. That is, until this weekend when un-cluttering and re-organizing the kitchen cabinets were on the agenda. Wahoo! Long lost and now loved again. You’ll be lickin’ your chops over this one! Preheat oven to 425°F. Season pork chops on both sides with salt and pepper. Dredge pork chops In a non stick skillet, heat 2 tablespoons olive oil and 1 tablespoon butter. Place pork chops in skillet and cook over medium high heat until browned on both sides (about 3-4 minutes). Transfer pork chops to a plate and cover. In the same skillet, heat 1 tablespoon of olive oil and 2 tablespoons of butter. Sauté onions and garlic until soft and golden brown. Stir in mushrooms, parsley and ½ teaspoon salt. Cook for 10 minutes. Grease an approximately 9-inch casserole dish with oil. Place half of the mushroom mixture on the bottom of casserole. 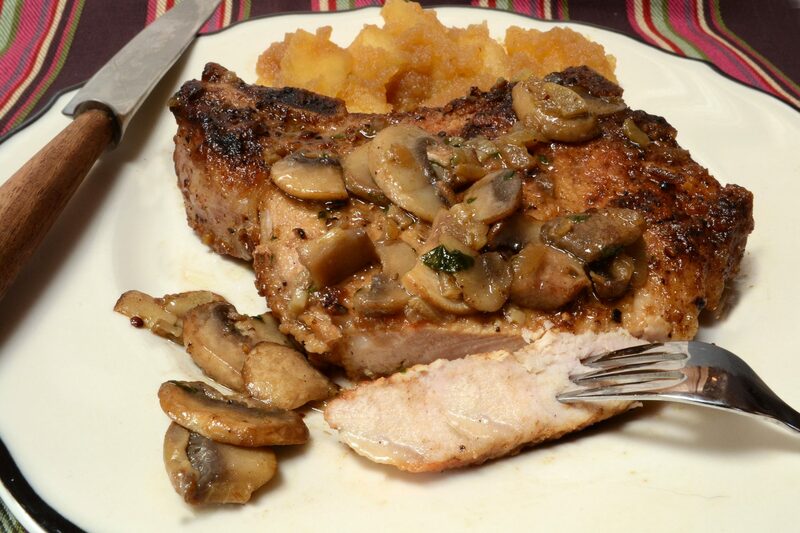 Place cooked pork chops over top of mushroom mixture. Top with remainder of mushrooms. In same skillet, add wine and 1 tablespoon of butter, and gently scrape up all remaining browned bits in pan. Bring liquid to a gentle boil and then pour over top of mushrooms in casserole dish. Bake at 425°F for 15 minutes. Serve with homemade apple chunks. In a medium saucepan on high heat, add all ingredients and cook for about 5 minutes until apples are soft, but still chunky. Serve hot or warm.